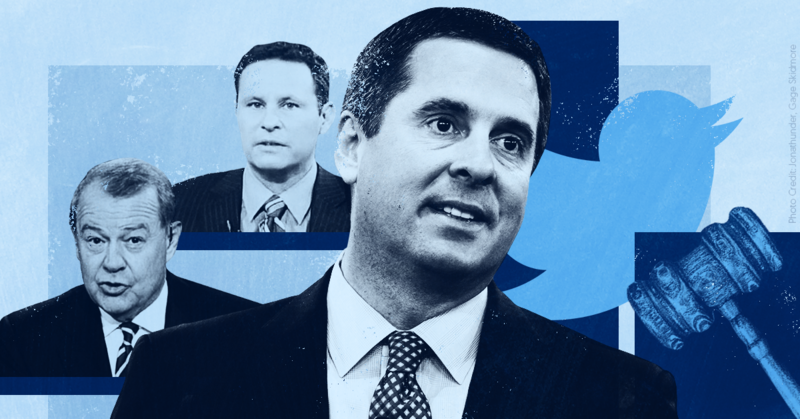 On March 19, Rep. Devin Nunes (R-CA) filed  a lawsuit against Twitter and three specific users, claiming that the site has censored him and allowed him to be the target of defamation. The Washington Post called  the lawsuit's merits "questionable at best," but Fox hosts and contributors covered the lawsuit credulously, suggesting or even outright agreeing that Twitter tries to censor conservative accounts. In the $250 million suit, Nunes argues  that Twitter is routinely “shadow-banning conservatives” on its platform by allowing them to post but not letting other users see or interact with the content. Twitter denies  that it shadow bans accounts, and CEO Jack Dorsey told Congress  last year that the company has not found any evidence of a difference in the reach of tweets from conservative and liberal accounts. Following similar allegations of shadow banning last summer, The New York Times also found  no evidence that Twitter engaged in the practice. After news of Nunes’ suit broke, Fox’s Sean Hannity hosted  the congressman on his show and allowed him to rant about Twitter’s alleged political bias and supposed censorship.